The winter months are on their way and it’s getting colder and colder outside – which means that as the temperature drops your energy bill will start to skyrocket. It’s inevitable that you will need to spend more money on energy during the winter – but there are many things that you can do to cut down on the costs. Install energy saving heaters in your home. They are designed to keep your home nice and toasty while costing less money to heat. There is a large range of products to choose from at Electric Radiators Direct. Use the sun for free heat whenever possible. Open up the curtains of your south-facing windows during winter days so that you can bring free heat into your home. When the sun goes down, close the curtains and keep the heat inside. Instead of turning up the heat, put a jumper and some warm socks on instead. This doesn’t mean that you should be freezing inside your own home, but if you can wear a bit more clothing to save some money over the winter while still being comfortable, it’s worth it. If you have a ceiling fan it can used to your advantage. The warm air rises and eventually gets trapped near the ceiling where you can’t enjoy it. Turning on the ceiling fan will help to push hot air back down so that you can feel warmer. Invest in very warm flannel sheets and a comfy duvet and then turn the thermostat down at night. You can save quite a bit of money every winter by doing this – just make sure that you have a robe and some warm slippers to wear if you need to get out of bed in the middle of the night. If you have any rooms that you don’t often use, such as a large storage area or a guest room, you could consider closing the vents and turning off the heating to those rooms. Give your central heating system a check-up. If it is not clean it can run very inefficiently and cost you a lot more money than it should. Make sure that you check on your furnace filter every month and that you replace it when it gets dirty. Add a humidifier to give the air more moisture. Humid air holds heat better and feels warmer, so this can make your house feel warmer even when the thermostat is at a lower temperature. Make sure that your home is well insulated. Why spend a lot of money heating your home when the heat escapes into the outside? Get some insulation and make sure that all areas where heat might escape are covered up. 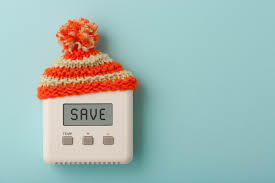 These are just a few tips to keep in mind in order to save money on energy this winter.